Distance: 7.2 miles. See our route here. Company: Mary, Jerry, Carolyn, John A., a big piece of cake, and friends. Bike Friendly? Thumbs up. Racks outside, a front outdoor sitting area to keep an eye on the bikes. Observation: Low-key neighborhood hangout spot. Great for a casual weekend outing. The coffee is spectacular. Coffeeneuring season has returned, and in honor of this auspicous event, I’ve oiled the chain and pumped up the tires here on TDR. I’ve been on a long hiatus from blogging, waiting for inspiration and motivation. 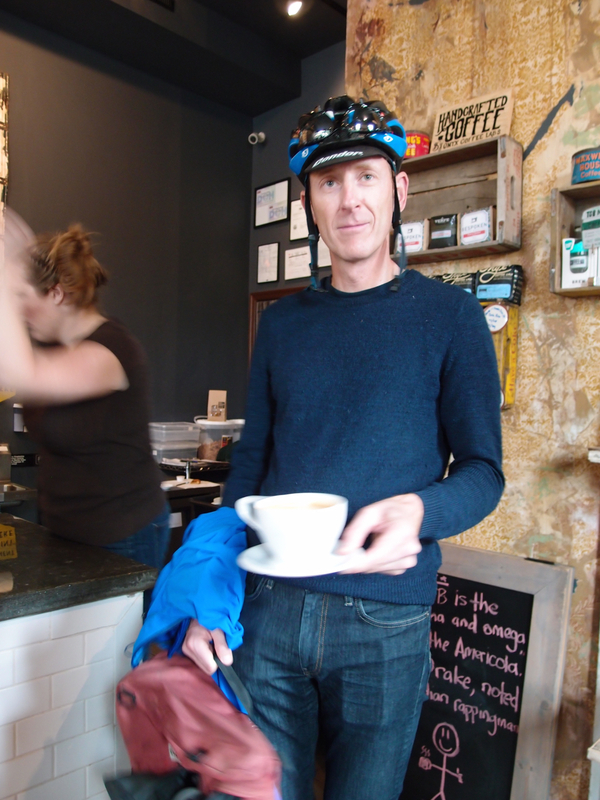 There’s nothing better than Coffeeneuring to get back in the saddle, so to speak. Mary (the very inventor of The Coffeeneuring Challenge) and I were signed up to ride the Seagull Century on the Co-Motion tandem, but the organizers canceled the big annual event because of the dire weather forecast. There we were yesterday, hanging around the house, when Jerry S. emailed about getting together to inaugurate the Coffeeneur season together. 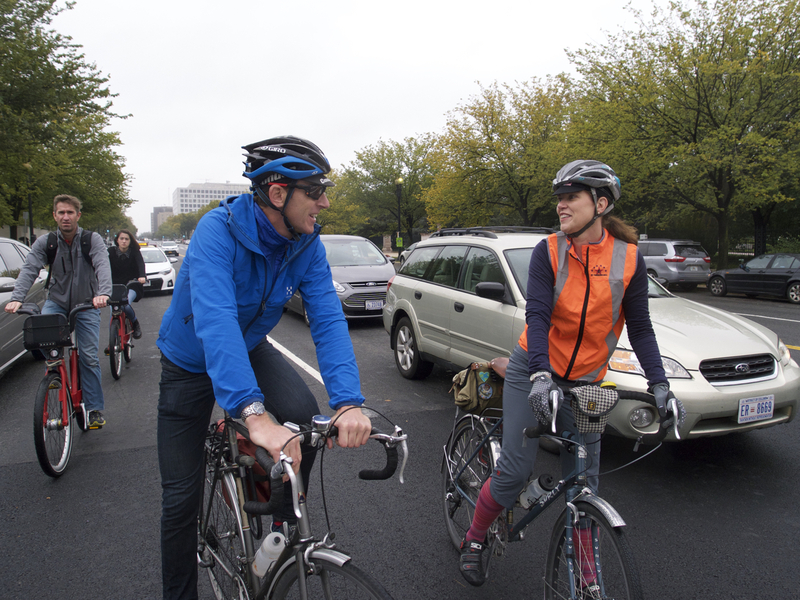 The big rains didn’t materialize, though the day was grey, cool and misty, making it perfect for a little ride in DC and some hot beverages. Jerry and Mary and the streets of DC. I paused in my push to complete the building of my new Velo Orange Campeur touring bike. This bike is going to be my daily commuter and grocery-getter, with the occasional foray into the country. It replaces my 1992 Cannonade T-700, whose frameset has been hung up. It had some problems I got tired of dealing with. We do most of our country riding on the tandem these days. I’ll probably take the VO to Harpers Ferry this coming weekend to the Freedom’s Run event, where Mary is running the marathon and I’ve entered the 10K. Back to yesterday: Jerry came by our place and we talked bikes and Nitto front racks for a few minutes in The Dining Room Bike Shop. Off we went with Mary through mostly-deserted streets of DC. I rode my Rivendell SimpleOne singlespeed bike, which doesn’t get much use but is always a pleasure to ride. The Coffee Bar on a Saturday afternoon. 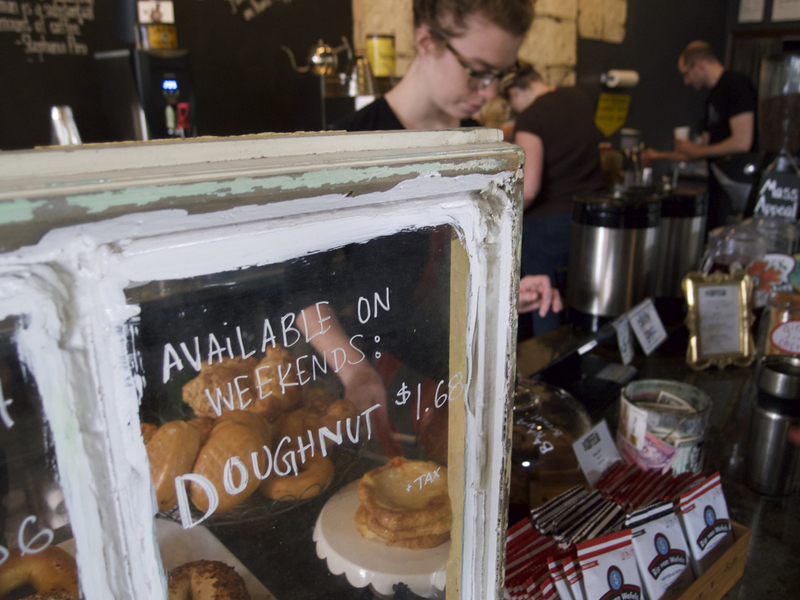 The Coffee Bar is billed as an “eco-chic coffeehouse offering seasonal specialty drinks alongside bagels & pastries in a cozy space,” housed in an old hardware store. I’ve coffeeneured here before. The vibe is hipster&laptop, but the staff are all really nice and the espresso is top notch. 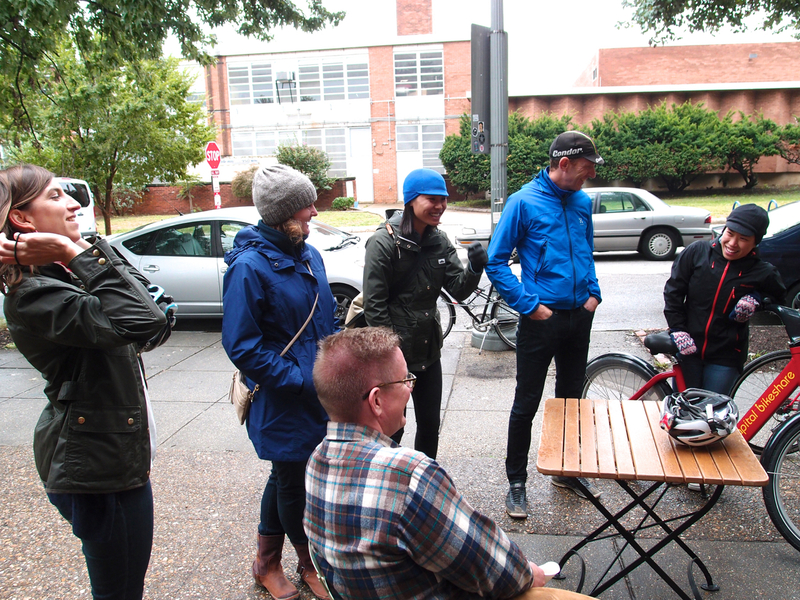 It’s a good landing spot for apartment-dwellers in the Logan Circle area who wear nice clothes and appreciate good coffee and tea. A Portrait of the Coffeeneur. We saw two other riders we know there, and John A. came out to sit with us. He had already claimed credit for his coffeeneuring trip of the day at another place, so this was a bonus-level stop for him. Mary, Jerry and John (and your photographer in the window). We spent a pleasant hour outside in the fall air discussing the nature of the states that are in the Midwest (Dakotas? Kansas?) until Carolyn and friends rode up after brunch, and that led to some nice conversation about bikes and city riding. We complimented Carolyn on the fine chocolate and raspberry cake that she made, which Jerry had brought along for us to sample. Oh, the coffee: I had an espresso (which was excellent) and a soy cappuccino (which was also excellent). Highly recommended. Afterwards Mary and I got pizza dough and other stuff at the grocery store and went home, under more mist. 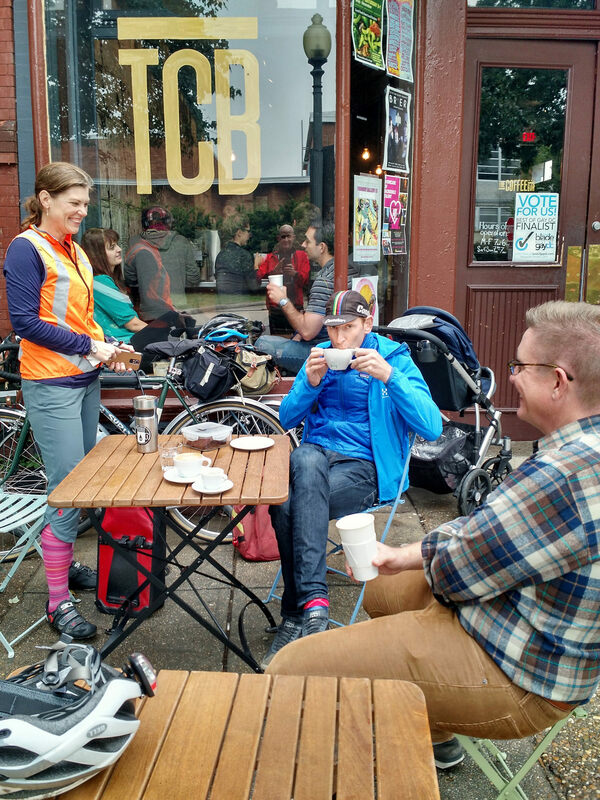 Twitter was buzzing with people posting their Coffeeneur outings yesterday, and I was glad we got out on Day One to join them.